Hildegard of Bingen (1098—1179) is a German mystic, known today for her writings and musical compositions. She founded monasteries in Rupertsberg in 1150 and Eibingen in 1165. Her writings include poems, liturgical plays, songs, and books on medicine, theology and botany. She also wrote three books of visions, including Scivias, which she dedicated ten years of her life to write. She told her story, once, as follows: "Listen: there was once a king sitting on his throne. Around him stood great and wonderfully beautiful columns with ivory, bearing the banners of the king with great honour. Then it pleased the king to raise a small feather from the ground and he commanded it to fly. The feather flew, not because of anything in itself but because the air bore it along. Thus am I 'A feather on the breath of God.'" Interest today in medieval women of the church has led to extensive reading of Hildegard’s writings, and interest in her life. Her music has been extensively recorded. 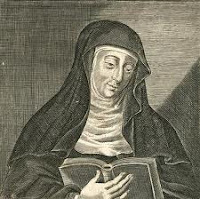 The ensemble Sequentia has made Hildegard a particular focus, having now recorded her complete works on seven CDs. The following poem was translated by Barbara Newman. and never slides to an end.